This is an issue of the 'in-house' magazine published by Hagerty the collector car insurance company in Traverse City Michigan. The magazine started in early 2006 as a 24-page marketing tool for their business and was sent out to clients who insured their car with Hagerty and by now had grown to 68 pages. 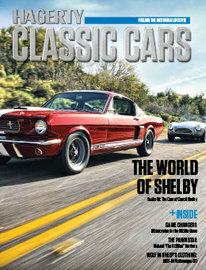 Originally titled Hagerty's, ten years later it has grown to full-blown 84-page car magazine. From early 2011 was simply called 'Hagerty' and published with the ISSN number 2162-8033.